Midnight Bamboo Bread Case - Cal-Mil Plastic Products Inc.
Showcase freshly baked bread, pastries, bagels or any baked goods with this beautifully made bread case. It features a dark wood frame and glass green acrylic drawers each with dark wood handles for easy access while organizing and displaying your goods. 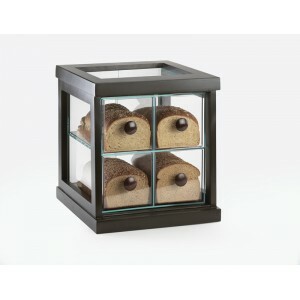 This case will complement any bakery, cafe, restaurant, or food service area and is sure to catch the eye of your guests. With wonderfully made goods displayed in a stylish and modern case, you cannot go wrong!